the sand at the bottom burnt my feet. On one side was a patch of hot earth and a pool of hot water, but I had no idea of anything more. The fact was, that the water at the side was the smallest portion of the hot spring; by far the greater quantity discharging itself through the bed of the river. We constantly passed near places where there appeared to have been springs formerly, and often there was steam hissing from slight fissures in the rocks which might be passed unnoticed. One in particular was under a small waterfall; and I should never have discovered it had it not been that I thought the water made a most extraordinary noise, which I found was caused by the water pouring down on the very hole from which the steam escaped. We arrived on the last bank of the Waikato on Saturday evening, and rested the greater part of the following day; after which we went about three miles down the river in a canoe, and found a temporary encampment of natives belonging to the great Waikato tribe, who had come there for the purpose of catching crawfish, shell-fish, &c., and snaring ducks and shags, which were very abundant. My natives took care not to find these people till it was near the evening, as they thought, if they did, I should go on as soon as I reached the other side of the river, although it was Sunday. up their minds not to stir for the day, on the plea of having walked so far on the preceding one. I wondered at their contumacy, and got very angry with them; especially when I found out that our resting-place was only about ten miles off; so I stormed away for some time, and then proceeded to take more violent measures: at least, so far as to lift one or two of them off the ground, and give them a gentle kick behind at the same time, and a few touches with the strap of my shot-belt. I at last got them all loaded and started a-head, threatening all I could imagine in case they did not follow quickly. As I went on ahead with a new guide, I found out the reason of their unwillingness. The old chief had brought them an immense pig for a feast, and as they had already stuffed as much as they could, they wanted to wait till the evening to kill it, and have another good feed. I looked back from the top of a hill, and saw that they were really on their way, and was satisfied; for when I found out the cause of detention, I feared it would prove too powerful for them to overcome - a pig being as irresistible to a New Zealander as turtle to an alderman, especially when it is to be had for nothing. side of the lake for about a mile, both hungry and angry; to my surprise I found at the place to which I was led, not only my own lads, but the old chief Pirata, with several other men, and women, and boys. On my inquiring about food, they said the pig would be there soon, which I found, to my great surprise, to be the very identical one which had caused me so much trouble at Pirata. This was, it must be acknowledged, a most hospitable action on the part of the old chief, not only to provide a feast for us, but when we would not stay to eat it, to send it after us to try us again. I speedily caused the unfortunate porker to be killed, without allowing him time to recover his fatigue; and immediately set half-a-dozen boys and girls cooking pieces of kidney, liver, &c., on sticks over a fire - a method of cooking which at that time I settled in my mind to be much superior to any other for the inside of a pig. I distributed some physic to the natives, and was much amused at the cool manner in which they sucked down the nauseous boluses of rhubarb, aloes, peppermint, and the like abominations, without drinking anything afterwards to wash them down. I was provided with this medicine by the kindness of Mr. Chapman; and found it very useful, as the people were all sickly from influenza, which had been violent among them. getting your clothes daubed all over with the red dirt which has saturated their mats. change, and the easy mode of life which they enjoy at the missionary establishments. Peter immediately volunteered to go with me to Tongadido, and I was very glad to have him, as he was known to the inhabitants of Towpo as a missionary native, and consequently could answer for my not being a “Pakiha Mowrie,” a character the natives hereabout seemed to hold in great suspicion - owing to the reports of the missionary natives with whom they had had communication - Mr. Peter most likely for one. Had they been more in the habit of seeing white people, they would not have cared much whether they were missionaries or Pakiha Mowries, provided they had plenty of tobacco to give away. After resting an hour at this village, which contained about five hundred inhabitants, we again set off with the addition to our company of Peter and another native belonging to Mr. Chapman, and a chief, a friend of theirs. get there till it was just time to pitch the tent. They never vexed me so much before; but their reason for delaying me was that they were afraid, if they reached the end of the lake before the evening, I should insist on their starting with me for the mountain that night; and they thought it would be much more pleasant to spend it in the village than in the woods, which was just the contrary to my notion. It may not be amiss here to give a description of Towpo, as I am but the second European who has ever seen it, and as it is not likely to be again visited for a long time. My visit having taken place only three weeks after that of my predecessor (Mr. Chapman), it is very certain my account of it, imperfect as it will be, must be the only one that has ever reached Europe, and may therefore be considered valuable. sible from the west, in spite of its equal height. The cliffs around the greater part of the lake are of a dark greenish colour, tinged sometimes with red, and are basaltic. The fissures are irregular, but run quite perpendicular; and the whole face of the rock presents much the appearance of a mass of common starch, but on a gigantic scale. On the west coast, about the middle, there appears, for a considerable extent, a dazzling white outline; but I do not know what it is. The natives said it was not a very hard stone. The white cliffs were not so high as the dark ones - rarely more than two hundred and fifty to three hundred feet. There is plenty of obsidian near the lake, and it is cast up on the shore in many places, but I did not see any in situ. The water is of a deep blue colour, appears exceedingly deep, and no weeds growing in it. made so by this custom of the natives: but I hardly think such can be the case. It is to be taken into consideration, that potatoes have not been grown in the island for more than fifty years; and the natives must have been both very much more numerous and industrious, to have cleared such a quantity of land in so short a time. Although I do not think the growth of potatoes sufficient to account for the absence of forest over a great part of the country - perhaps more than half - yet it is certain the wood has decreased, from some cause or other, within no great distance of time; as I constantly found logs and roots lying in the wet ground of the barren moors, where they could not have been brought by any natural causes; and they were too distant from any place where they grow at present, as well as too useless, to have been conveyed there. The natives now yearly destroy large quantities of land, by their wasteful system of agriculture, and in time there will be no timber-land left: but this cause has not been long in operation, and is inadequate to the visible effects on the face of the country. to the constant fires which the dry nature of that plant causes to spread in a most destructive manner. A person who paid attention to the subject might easily tell how many years had elapsed since the forest was cut down in any particular place, by observing the height of the fern. In the first year, after its cultivation for potatoes has been discontinued, the fern springs up to ten, or even thirteen feet in height, gradually dwindles down to six inches, and at last vanishes altogether: it is then replaced by a short wiry grass, growing in small tufts, about a foot apart, with nothing between, and presenting the most desolate appearance. more people here, especially an old chief: I was very loath to give this old fellow any, as I did not expect to do him any good; old age seemed to be his only disease; he was a quiet old man, and was led about by a little girl, I suppose his daughter. I gave him some boluses, and told him how to take them, and when I returned, found that he was very much pleased; as he said they had quite cured him - of what it would be difficult to say, for when he first came to me his tongue was as clean and his pulse as firm as anybody need wish. His cure quite established my reputation as a physician, and I had innumerable applicants afterwards. The natives were very curious to know what was the use of my collecting so much trash in the way of stones and plants; so I told them that we Pakihas made all the “rungwau,” with which we cured them, from these things. But even this did not make them more willing to carry a basket of stones, or a portfolio of dried plants: although they would carry twice the weight of tobacco, or my tent, which was very heavy, without any grumbling. I thought I could distinctly see the top of the hill opposite us, through the vapour on its summit. Between us and the other mountain there was a plain and a lake, but I saw it would be impossible to reach it that day at all events. The worst part of the business was, that there was no track to be found down to this lake, and although it did not appear half a mile from us, it took us nearly three hours to force a passage to its shores. The greater part of the side of the mountain was covered with the common arborescent Veronica of New Zealand (V. diosmaefolia), which, from its never becoming anything more than a bush, impeded our passage much more than a large forest would have done, and, besides, prevented our ever seeing the lake or mountain opposite, although the descent was always exceedingly steep. I began to think we must be wrong, and that we had gone round the side of the mountain, instead of directly downwards: but a glimpse of the lake showed my error. Although the lake appeared further off than it did from the top of the hill, yet it was still immediately beneath our feet. Peter and myself at last reached the open plain in which was the lake, and were soon after joined by the rest of the party. snow-white berries, and the others red ones, but not differing in any other particular. They would undoubtedly grow out-of-doors in England. I afterwards found a third variety, or rather a second species, with pink berries, more beautiful than the red and white ones, but not so good to eat. From this lake, which was called Rotuide or Rotuite (Ro-twe-tee), the character of the vegetation entirely changed. The fern on the open land vanished, and was replaced by grass of which I collected more than twenty species, some of them very good for pasture. The common plantain was also abundant, as it is all over the island; so that if I had not the example of the potato before my eyes, I should consider it indigenous. On the shore of Towpo I found a fine plant of wheat. How it came there the natives could not tell me; and as undoubtedly Mr. Chapman was the only European who had ever visited the place before, and three weeks was too short a time for it to have sprung up and come to perfection, its existence there was very curious. In this little lake there were no fish longer than two inches. There were large flocks of gulls, and of the small species of black and white tropic birds which frequent the coasts of New Zealand. There were also, as on all the other fresh waters of New Zealand, abundance of cormorants of two species - one very large and black, the other black and white, and small; and plenty of ducks. The wood which covered one side of the lake was the only one I ever saw in New Zealand composed entirely of one sort of tree. It was an open forest of Totara [Podocarpus totara], and strongly resembled the pine-woods of Canada. The trees were not large, but still large enough to make very good Ti-wais. Canoes and paddles are always made of this wood on the south side of the Thames. It is more brittle than cowrie, but more durable. At this village I saw a woman so very light, that she had a perceptible colour in her cheeks. I intended to say to her, jokingly, that she was a white woman (Whaiheinie Pakiha), not a New Zealander (Waihini Mowrie): however, she understood me to ask her whether she would be my waihini, i.e. my wife, and immediately came over to the mouth of the tent where I was sitting, and seated herself beside me - to our great astonishment, for all knew that I never allowed any native to come inside the tent. I was still more surprised to find what an easy conquest I had made. I, however, explained, begging to be excused the honour, as I was a missionary, and missionaries did not marry any but white women. She took it in very good part, which in all probability is more than most English women would have done in case of a similar disappointment. One great peak of Tongadido slopes up from the lake; but while I was there, I could never see the top of it, in consequence of the quantity of vapour always rolling up the side of the mountain from a great many hot springs which are visible on its sides. From one of these a considerable stream of water runs into the lake, but gets cold by the time it reaches it. The side appeared quite barren, with the exception of a small belt of wood about two-thirds up the visible part of the mountain. Rotuite may be said to be the real source of the Waikato, as the stream which runs out of it is called by the natives; those which run into it are very insignificant. The mean of four days gave for the barometer 28 5/20 degrees; thermometer, about 56 degrees. course, and they did not lift their heads above the level of the top of the bank on which they grew. The stream which here runs down from the mountain is, I have no doubt, (from observations I made afterwards, compared with what I observed at the time of the general direction of the country,) the one called the Waipa (Wypa) or western branch of the Waikato. It is here a noisy mountain torrent about four feet deep. I regret that I did not ask what they called it, as it is very likely they knew it to be a branch of the river called the Waipa when it flows further to the north. I found out that the road we had travelled was one which formerly led to some part of the Waikato country, but now disused, and that it was the only place where the base of the cone could be seen; that nobody had ever approached nearer than we now were; and that the reason was, they were afraid. They said that formerly when they passed this point of the road they used to cover their heads with their mats, because it was “taboo” to look at the mountain, or at least the peak. The night was exceedingly cold, but I did not feel it so much as I did on the Waikato. I found here a most curious little plant of the yew family (Dacrydium); it was not larger than a clump of moss, and was mistaken for a moss by me when I first saw it. I found here also the curious Forstera sedifolia, and many new composite plants and Veronicas. but the two streams were very insignificant, not longer at the utmost than three quarters of a mile each. I had no idea of the meaning of a “sea of rocks” until I crossed them; the edges of the stony billows were so sharp, that it was very difficult to pass among them without cutting one’s clothes into shreds. I at last arrived at the cone: it was, I suppose, of the ordinary steepness of such heaps of volcanic cinders, but much higher. I estimate it at 1500 feet from the hollow from which it appears to have sprung. It looks as if a vast amphitheatre had been hollowed out of the surrounding mountains, in order to place it in. The sides of all the mountains around are quite perpendicular, and present a most magnificent scene. A circular plain of sand at the north-east base would have been a fitting scene for the wildest piece of diablerie that ever entered the brain of a German, or was embodied by his pencil. Thermometer at base of cone, fine sunshine, 65 degrees in sun; no shade to be had. Barometer, 25 14/20. down. It unfortunately happened that the highest part of the crater’s edge was to leeward, otherwise I might have stayed there a little longer. I had not got quite down to the sandy plain I have spoken of, when I heard the noise of another eruption, but am not certain it came from the crater I had just visited. I thought at the time it came from another branch of Tongadido to the northward, on the top of which I had seen a circular lake of water when on the peak. I was half frozen before I reached the ravine, and thoroughly drenched by the mist; so that I was very glad when I found the place where I had left the natives and the fire. I got back to the tent about seven in the evening. The barometer stood when at the base of the cone at 26 1/10 inches; but I could not take it up further than the streams of lava, as I had quite enough to do to get myself along without having anything to hold. The natives said that they had heard the eruption which took place as I was returning, and that the ground shook very much at the time; but I did not feel it, perhaps because I was too much occupied with the difficulties of my path. When I returned, I was much annoyed to find a party of natives, consisting of three chiefs from Towpo, who had come, they said, to see how I was. Had they brought any provisions, I should not have cared; but being chiefs, that was impossible; and it was equally impossible for me to tell my natives not to give them any. The consequence was, that I was obliged next morning to return to Rotuite, instead of staying another day at the mountain, as I particularly wished and intended, being, in fact, completely eaten out of house and home. hashed pig's-head and some cold potatoes to carry, and taking a kit in my own hand, set off in the direction of the water-course in order to botanise. I found the red-flowered variety of the flax (Phormium) growing in the wet places almost as far up as any plants except veronicas. Perhaps this sort would be more advantageous to grow in England than the large common kind. The fibre is equally strong with that of the pale-flowered sort, which is not the case with another species I found afterwards growing on other mountains, which, however, I take to be a distinct species; not a mere variety, as the seed-vessels were hanging, instead of upright. I found also a perfect yew about two feet high. The only perceptible difference, except in stature, was that the seed was not quite so much imbedded as in the English yew. Barometer at encampment 26 19/20, thermometer 45, at nine p.m., cloudy-mizzle. to-night by supposing that the wind changed after the tent was pitched. Mahia, whom I had left here because he complained of being ill, was very glad to see me, more especially, I dare say, because he said that they had been rather sparing of their potatoes while I was gone. a fig or two of the “weed,” in order to make it up with him. Shortly after, another pig was brought as a present for me because I had ascended Tongadido. I could not find out who sent it, and was obliged to let the natives take it along with them. I found it had been given by some person on the road, and had been driven on by some of the hangers-on of my party. This was a curious circumstance, as most of the natives were exceedingly jealous of my achievement. Fire-wood was very scarce here, so that I was obliged to buy it, giving an inch of tobacco for a back-load, a very high price considering the ordinary prices current of New Zealand. Went a short distance on the lake, back to the village where Mr. Chapman’s house was building, in order to please Peter. March 6th. - Had some difficulty in getting a canoe to-day, owing to a disinclination on the part of my natives to leave the place. I do not know what had become of the canoe we brought with us, but suppose some people who wanted to go to the other end of the lake had taken it with them. When I found out that there was no disinclination on the part of the natives at the village to lend me a canoe, but that only my own natives wished to throw obstacles in the way of going, I soon got over all difficulties by a few figs of tobacco judiciously applied. time with great animation. He at last worked himself apparently into a most terrible pitch of fury, at which I only laughed. The cause of complaint was my having ascended Tongadido. I said that a Pakiha could do no harm in going up, as no place was taboo to a Pakiha; that the taboo only applied to Mowries; and finally, that if the mountain was an atua, I must be a greater atua, or I could not have got to the top of it, and that it was all nonsense to put himself in a passion with me, as I did not care for it; but if he would see that the people made haste with the canoe, I would give him some tobacco. I then took out one fig for each of his companions, who sat still all the time without saying a word, and gave him three figs. It proved a most astonishing sedative. He quite changed his tone in a minute and sat down again. He could not help saying, however, that if he had thought I could have gone up the mountain, he would have prevented my ever trying it, and requested me not to tell any other Pakihas of it on any account. There were no great thanks due to any of them for letting me go, when they had done all in their power to misdirect me; but I thought it as well to let the matter rest, and shook hands with him. not eat white men;” a pretty strong hint that there were plenty there that would make no difficulty about the matter. This was the only time that a native ever said anything to me more than impertinent; and I believe that the greater part of his rage was put on in order to try if he could not frighten me. In consequence of these interruptions, it was about twelve o’clock before we could proceed. Peter took leave of me here, as he was going to remain to superintend the erection of Mr. Chapman’s house. He brought a pig as a parting gift. He was a most excellent specimen of a native; had been of great assistance to me; and I was very sorry to part from him. I gave him a knife, some beads, and about a pound of tobacco; but his joy at receiving such a magnificent present was not sufficient to clear up his countenance. Mr. Chapman, in speaking of him, afterwards said that his chief fault lay in his heart, which was as soft as a piece of dough, and that he never had reason to find fault with him, except for not knowing how to say “no” to the other natives. 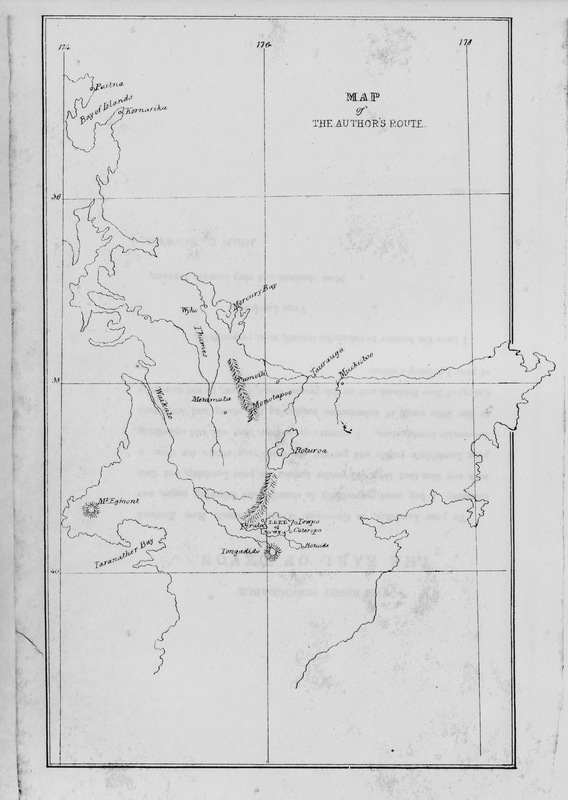 This somewhat inaccurate map, the frontispiece of Rambles, shows the principle locations described in the text.